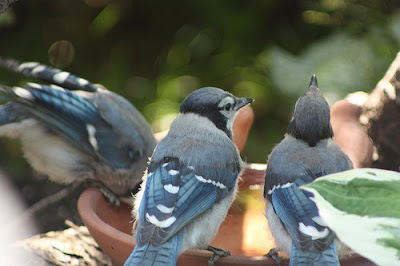 I could not help myself - I had to post this picture because how often do you get six blue jays in your garden with three of them vying for a spot on a tiny birdbath. These three look like they are having a good gossip session over tea. Life feels odd right now. I am back at work after my week off. I get into these introspective moods after coming back from holidays and I try to think of the quickest ways to retirement that I can imagine. I love my time off - especially if I am at home working on my garden, or knitting, or going for a run along the river. Time is such luxury! Moments to do the things I love to do and keep myself busy with activities that give me pleasure are so fleeting. The Babe tells me that after a month of the same, I would be bored...but, not having had that experience, it is hard to imagine that this would be the case. I have a good job - good in the sense that it pays me well, I have a degree of freedom, and it can be interesting. But my career does not define me - my love of art, writing for fun (not for work), knitting, running, climbing and my photography comprise who I am. I can't imagine I would ever get bored of these pursuits.